When we think of hunger, our mind naturally envisions impoverished people living in other parts of the world. It is difficult for many of us to consider that hunger exists right here in our own backyard. Without food a family can't function, a child can't learn and an adult can't work. Yes, there is hunger in CT. Hunger and food insecurity are problems for many CT citizens, despite the fact that our state is one of the wealthiest in the nation. Everyday some CT residents wonder where their next meal will come from. According to a recent survey done by the CT Food Bank, 42 percent of the clients had to choose between paying for food or utilities, percent between food or rent and 30 percent between food or medical care. The need has worsened with the economic downturn. 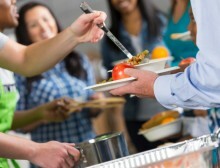 Established in 2011, Master's Table Community Meals, Inc. is a 501 (c) (3) non-profit organization whose goal is to help the less fortunate members of our community. This includes, veterans, elderly, unemployed, underemployed, poor, migrants and homeless – women, men and children. We feed the hungry by providing them nourishment and clothing. Master's Table Community Meals provides meals at no cost to our guests and is sustained by committed and compassionate volunteers and also, by the generous contributions of donors. We do not receive funding from the county, state or federal government. We hold on to the belief that while we may not be able to help everyone, we will support as many individuals and families as we can. We have a "no questions asked" policy.